The ‘’EU Project, My Project’’ campaign which ran between 12 and 19 May has shown once again that it is worthy of its name and that even the smallest of projects can leave a lasting effect on our environment and people. Slovenian citizens found this out for themselves at a number of events organised in towns and cities across Slovenia. This year, over 3,000 visitors attended more than 40 events held in Ajdovščina, Brežice, Celje, Črnomelj, Grosuplje, Koper, Krško, Ljubljana, Logatec, Maribor, Martjanci, Metlika, Nova Gorica, Pivka, Planica, Postojna, Radlje ob Dravi, Tolmin, Trbovlje, Velenje, Vrhnika and Žalec to discover over 20 EU-funded projects, their work and achievements through a series of interesting workshops, interactive exhibitions, puppet shows, hiking, sports activities, other fun activities, and lots of great music and food. Our youngest visitors explored improvisation to make their own musical fairytale, listened to exciting animal stories, enjoyed the performance of Fajn Theatre, tried to figure out what their ideal job would be with the help of rapper Trkaj, solved a detective mystery with puppets at the Ljubljana Castle, learned how to greet like a real tribal member with the help of Viki the American Indian, discovered what it was like to live in the era of Ivan Cankar, tried themselves in unusual sports games in the Olympic Sports Centre Planica, and ate tons of pancakes. Other visitors learned about renewable energy sources, searched for ways to reduce waste in everyday life, discussed tourism potentials and materials of the future, and helped design better regulations to support the economy. Our young visitors looked into future job opportunities and discussed possible education pathways. Outdoor recreation and history lovers stepped in to spring and took a refreshing walk on the circular trail of military history in Pivka where they ran across Martin Krpan, a fictional folk hero, and were later invited to forge themselves a good luck horseshoe. Those with creativity skills participated in a number of workshops ranging from silk painting and clay workshops to soap making workshops, vegan cooking classes, postcard design and scrapbook workshops which were held by multigenerational centres. 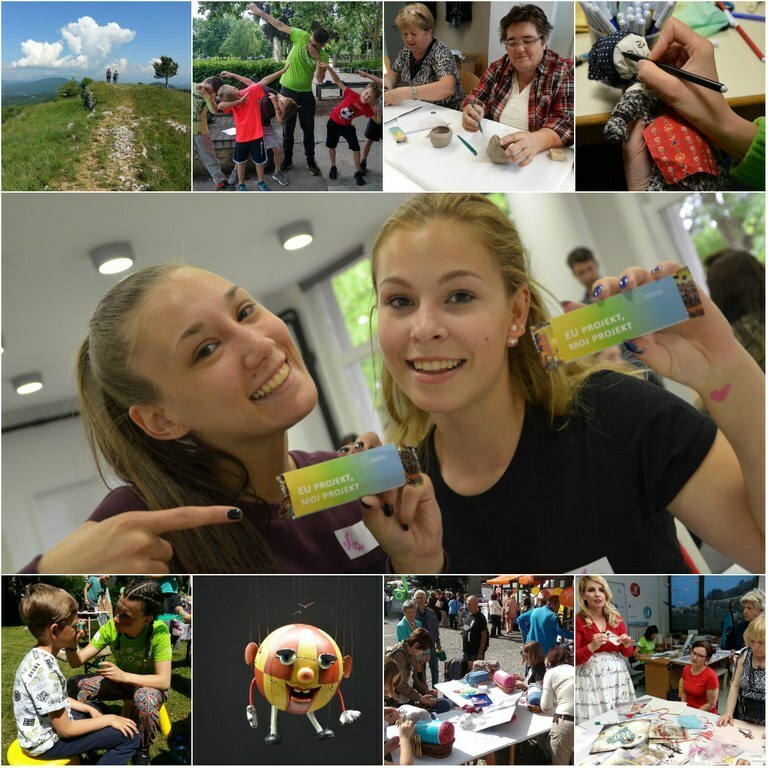 As many as 15 multigenerational centres operate today in Slovenia; these are open meeting places for people of all ages to come together, socialise, engage in dialogue, become active and creative, cooperate, exchange knowledge and experience, and take advantage of the diverse services offered by the centres. Now, the campaign itself may have closed, but the EU-funded projects are alive and kicking - by contributing to local community and environment through their activities they write new successful stories over and over again. In fact, over 6,000 success stories which were supported by the EU have already been delivered in the last 15 years. Another 3 billion euros is to be invested in people, infrastructure, environment, and economy to create more success stories in the years to come. There are numerous funding opportunities open in 2014-2020, and the supported calls for proposals, programmes or projects that help business ideas come true, unleash the innovative and creative potential, build knowledge, foster lifelong learning and create jobs. EU funding opens an array of opportunities for first-job seekers as well as senior workers who need to adapt to new technologies and job demands through upskilling and reskilling. Find your opportunity!